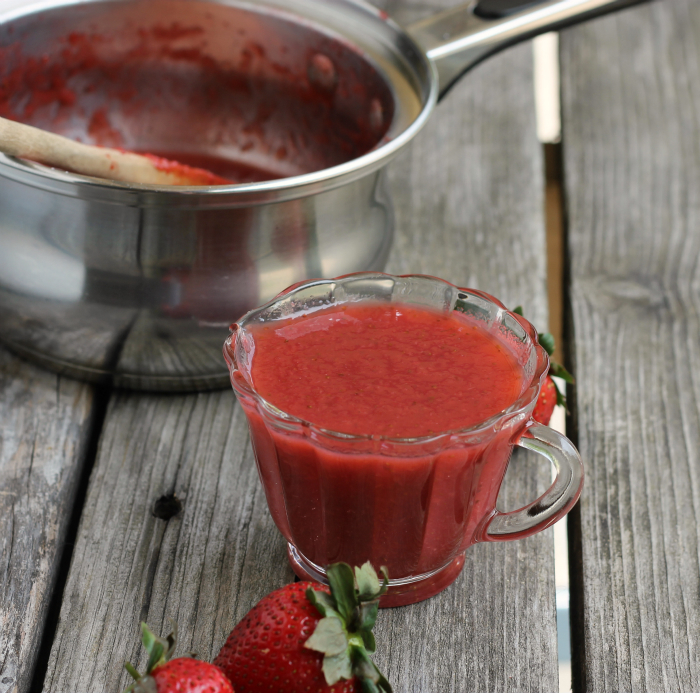 Strawberry syrup… so tasty on homemade pancakes. I have had this recipe in my recipe box for who knows how long. Every year when strawberry season rolls around I think about making it, but when the season ends there still is no strawberry syrup. When I had decided to make the lemon blueberry pancakes from my last post, I knew that I would need something special. I didn’t want to serve them with maple syrup or any old pancake syrup. This strawberry syrup came to mind and I knew that it would be perfect with the lemon pancakes. 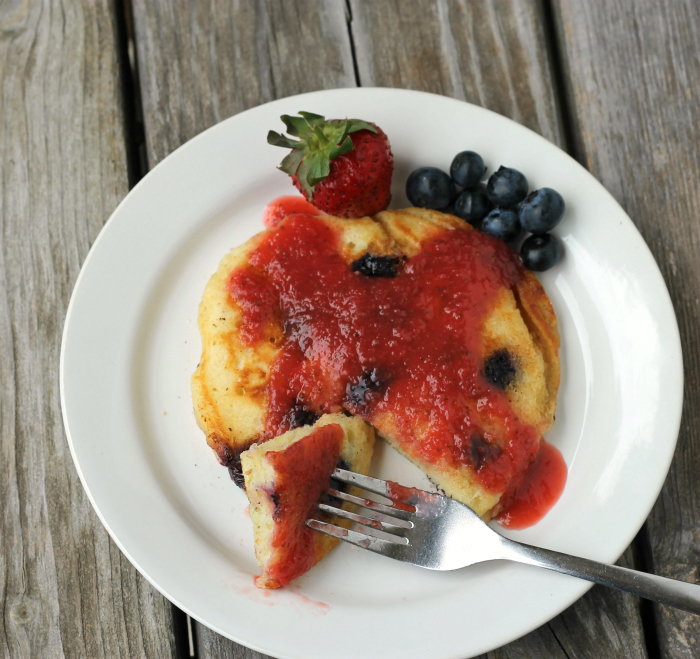 I love the combination of the strawberry syrup and lemon blueberry pancakes. I love the flavor of lemon with these summer fruits. Wouldn’t you agree? Yes, I think that it is perfect. The syrup is easy to make and really doesn’t take much time or at least the way that I made it. You are supposed to cook the berries and then strain them through cheesecloth, but I was a bit lazy and decided to run then through the blender and puree them. I am sure that this syrup would have a bit of a different result if I would have followed the recipe, but it was just as delicious the way that I chose. The strawberry syrup was perfect with the pancakes, but I think that would be equally as delicious served on some vanilla ice cream. That is a great idea… it’s time to end now, I can hear strawberry syrup and vanilla ice cream calling my name. 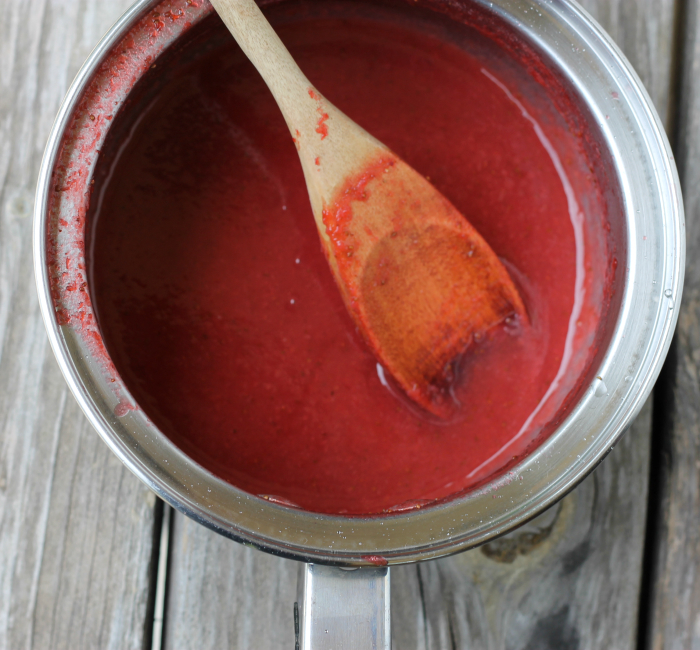 Add the pureed strawberries to a heavy saucepan add the zest and 1/2 cup water. Bring to a boil, reduce heat and simmer for 5 minutes. Remove from heat and set aside to cool. In the meanwhile place the sugar and 6 tablespoons of water in another heavy sauce pan. Bring the mixture to a boil and cook until the syrup reaches 260 degrees F on a candy thermometer. Remove from the heat and cool for 2 to 3 minutes. Add the berries to the syrup place back on the heat, bring to a boil and let boil for 8 minutes. Remove from and it is ready to serve. I want to pour this all over everything! It’s so multi-purpose. Delicious!! What a perfect way to use up fresh strawberries! I think I overdosed on maple syrup as a kid so always choose fruit to top my waffles and pancakes. Your syrup sounds like a fantastic option!!! We grow our own fresh strawberries. This looks like a great idea for strawberry syrup. Yum. Pancakes for breakfast with THIS syrup coming to my kitchen soon! Yummy n so easy to make with all natural ingredient. I really do think I could find excuses to put it on everything I eat – looks delicious! 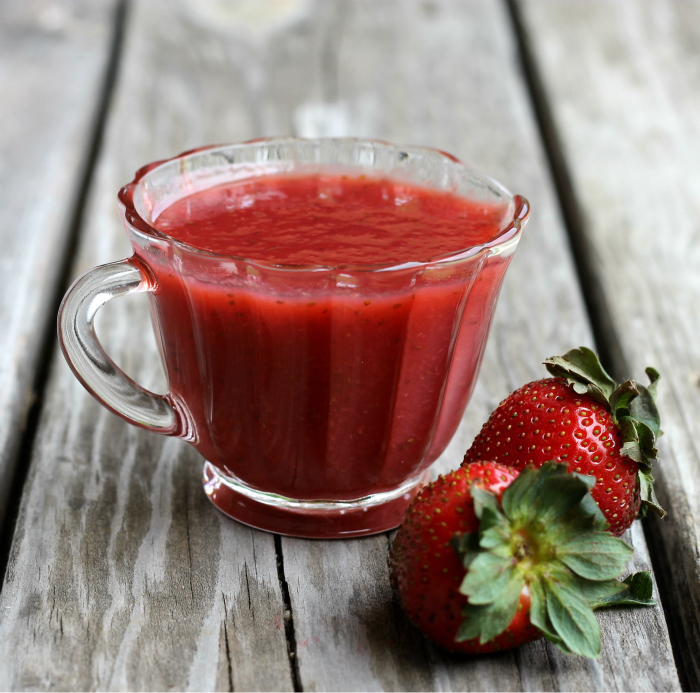 I love strawberries and I’m always looking for new things to do when I have a glut of them! This looks like a delicious alternative to jam making. 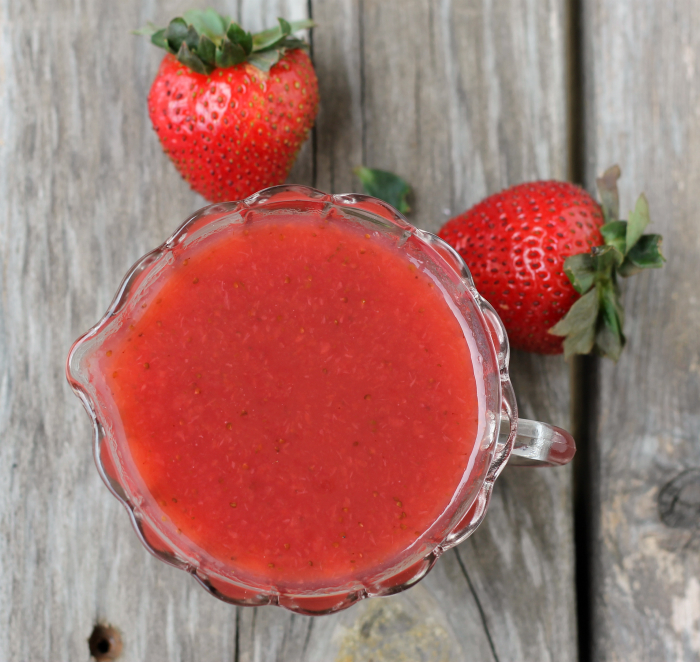 I love a good strawberry sauce and this one looks fantastic! I’d pour this over vanilla ice cream. Mmmm! I love strawberries. This would be the perfect sauce with my homemade vanilla ice cream.